Nuts and seeds add iron and protein to this nutritious luncheon meal. For a family potluck, double the recipe and prepare all the ingredients ahead of time to combine just before serving in a lettuce-lined bowl. In medium saucepan, bring broth and rice to boil; cover, reduce heat to medium-low and cook for 20 to 25 minutes or just until tender. Drain off any liquid and let cool. Meanwhile, in dry medium skillet, toast pecans, sunflower seeds and pumpkin seeds for 2 to 3 minutes; let cool. In bowl or jar, mix or shake together vinegar, oil, honey and pepper. Five to 10 minutes before serving, pour dressing over berries and toss to coat. 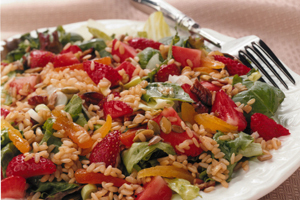 Add toasted nuts, seeds, green onions and basil to rice; stir in strawberry mixture and apricots. Serve at room temperature on lettuce-lined plates and garnish with fanned strawberries and basil leaves if desired.